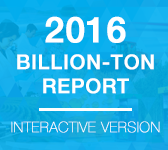 The 2016 Billion-Ton Report: Advancing Domestic Resources for a Thriving Bioeconomy is the third in a series of national biomass resource assessments commissioned by the U.S. Department of Energy. This report aims to inform national bioenergy policies and research, development, and deployment strategies. It is the first volume in a two-volume set. Volume 2 (forthcoming) evaluates the potential environmental sustainability effects of a subset of production scenarios described in Volume 1.